Switch between different bluetooth stacks in just several seconds or less, with two mouse clicks. No reboot required. Note, Bluetooth Stack Switcher does not contain any bluetooth drivers, all needed bluetooth stacks should be already installed and configured.Note, Bluetooth Stack Switcher does not contain any bluetooth drivers/stacks. Bluetooth Stack Switcher provides quick switching between already installed stacks only. ...... It provides quick switching between already installed stacks only. You should obtain and install desired bluetooth stacks yourself. Bluetooth Stack Switcher requires administrative privileges to run on your system. Supported operating systems : Windows 2000, Windows XP, Windows Vista, Windows 7, Windows server 2003, Windows server 2008. 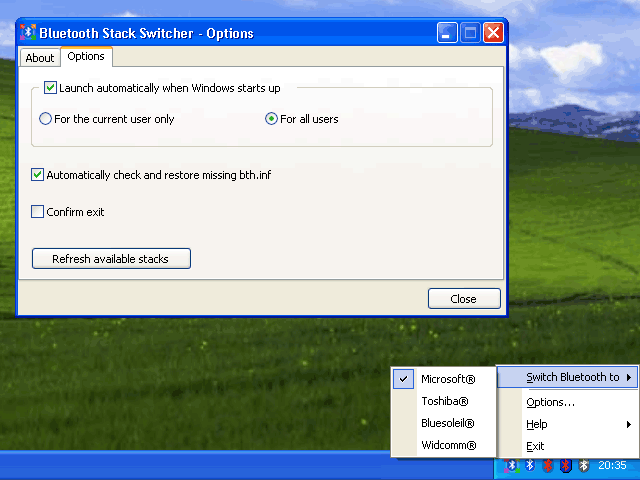 Note, Microsoft bluetooth stack is supported only on Windows XP, Windows Vista and Windows 7. Bluetooth Stack Switcher works on both 32-bin (x86) and 64-bit (x64) systems (since version 1.1). Currently, only configurations with single bluetooth adapter are supported. Give yourself more room on your 2K/XP desktop with this handy desktop manager. Qweas is providing links to Bluetooth Stack Switcher 1.1.0.25 as a courtesy, and makes no representations regarding Bluetooth Stack Switcher or any other applications or any information related thereto. Any questions, complaints or claims regarding this application Bluetooth Stack Switcher 1.1.0.25 must be directed to the appropriate software vendor. You may click the publisher link of Bluetooth Stack Switcher on the top of this page to get more details about the vendor.